Hello! How's everybody's week going? Did my fellow Americans have a nice Independence Day? 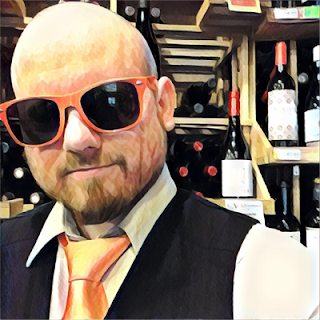 Myself being in the wine retail business in a tourist destination, I can tell you that I did not. It's the busiest week of the year and I'm just beat, man. My feet are killing me. My arms are sore. But I love my job and I love this time of year. Talking to people from all over the world about wine and getting them the perfect bottle for their visit here makes me happy. And, besides, a bit of wine at the end of the day will always make it all better. Because I'm just so run down I'm going to make this one quick. I've got two bottles here that you can buy in magnum format and are much better than your average Yellow Tail or Barefoot or Cavit. Let's drink 'em! 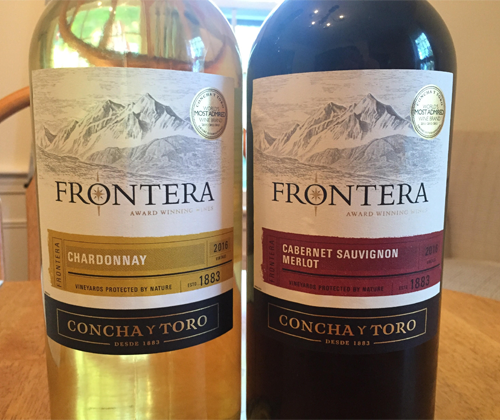 Frontera is an entry level brand by Concha y Toro, which is essentially like the Robert Mondavi producer of Chile (no relation, just an example). I've found Frontera to have some solid stuff if you need a large format crowd-pleaser. Their Pinot Noir is like raspberry juice. It's a lip-smacker. So when I was asked if I'd like to try their Chard and Cab/Merlot I jumped on it, and hoops were jumped through to get it to me. Thanks, Frontera! The 2016 Chardonnay is golden yellow. The nose has aromas of apple, melon, pineapple and a slice of butter. Pineapple takes over on the palate with hints of apple and melon. The star of this wine is the finish, as its slight touch of sweetness leaves a long lasting pineapple coating on your teeth, and spicy ginger tingles your tongue and inner cheek. It ain't Grgich but I wouldn't turn it down. The 2016 Cabernet Sauvignon Merlot is 85% Cabernet Sauvignon, 15% Merlot, and garnet in color. I was surprised to get some stank on the nose when I opened it. This little bit of funk (a good funk) turns into a big noseful of minerality after swirling and opening up. There's also plums, blackberries, and cocoa powder on the nose, and they all translate onto the juicy, fruit-forward palate. It's medium bodied with soft tannin and perky acidity. This wine seems like it would be great for gatherings when you need a wine that you personally can enjoy but are also serving a bunch of people who wouldn't care less if you were pouring Chateau Palmer.